Lincoln City boss Danny Cowley admits he is surprised the Cobblers have struggled in Sky Bet League Two this season, and has warned his team they are in for a real fight when the teams clash on Saturday (ko 3pm). The table-toppers take on Town for the third time this season, with the Imps having triumped 1-0 at the PTS Academy Stadium on the opening day of the season, and then winning 3-2 in the FA Cup first round at Sincil Bank in November. 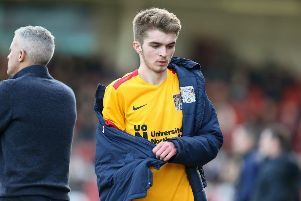 The two teams have endured contrasting seasons, with Lincoln being in and around the top two throughout the campaign, while the Cobblers have spent most of it looking over their shoulders at the relegation zone. Cowley admits he expected more from Town, especially after that opening day clash when Lincoln were lucky to claim the three points at the PTS, scoring with their only effort on target. “Northampton are a good team,” said Cowley. “On the opening day, they gave us arguably our toughest game of the season. “We were very fortunate, and (goalkeeper) Josh Vickers produced an outstanding performance which allowed us to find a way to win the game. “I was very impressed with them that day and I’ve been very surprised that they haven’t been able to find that level of performance consistently. If they had, they would be right at the top of the division. “They’ve got good players and a manager who is very experienced and knows the league. “I went to watch them at Tranmere on Tuesday and they were very well organised defensively and they have threats in offensive areas. “I was very impressed and they were worthy winners. “They signed some good players in January, they’ve lost Matt Crooks to Rotherham who was a good player for them. Lincoln go into Saturday’s game sitting top of league two, two points clear of second-placed Mansfield Town with a game in hand. They are nine points clear of fourth place so in great shape to win promotion this season. A sell-out crowd is expected for the visit of the Cobblers, with Lincoln playing only their second home game since December 22, and Cowley has urged the club’s supporters to play their part in inspiring the team to three points this weekend. “We will embrace the challenge of being top and not get ahead of ourselves, and we need our supporters with us, they have to stick with us,” said the Lincoln boss. “We feel there is the potential for this to be a very special moment, it won’t be perfect and there will be bumps in the road.